Dividing daylilies is the best way to create more plants for the garden. 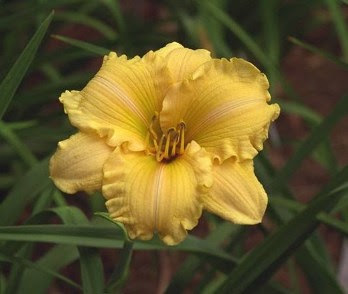 Daylilies are both beautiful and practical perennials. Their beauty is obvious, aided by hybridizers who have increased the characteristics of height , color, flower form, and even length of blooming season. Practical because they are so hardy, disease free, and tolerant of many difficult conditions. Using a garden fork it is easy to lift the clumps. The roots of the daylily, Hemerocallis, are fleshy tuber like growths and should be handled with enough care to keep them as undamaged. Cut the clumps apart into 6 to 8 inch clumps, and plant them into prepared ground about 2 feet apart. These large clumps will produce a good show of blooms the first season after division. Another way to get a much larger number of plants, although they may take more time to get to prime blooming size, is to tease out individual fans of plantings to start. A fan of leaves with roots attached should be planted on 6 inch circles. Keep them moist. Fall is a good time for dividing and planting clumps, spring is a good time for that method or the small fans. It has a step by step how-to with pictures and method. So if you have some dayilies to divide, take a look at this helpful resource. Now is the time!